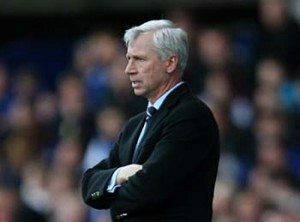 Does Alan Pardew Really Want Carroll? Coming out publicly and saying that he (Alan Pardew) wants Andy Carroll is a bit of a worry. There’s no way Newcastle United, irrespective of whatever formation Pardew comes up with, can he play Ba, Cisse and Carroll in the same team. The question then to be posed is; so does the manager know something that we don’t, which one of Ba and Cisse is on his way out??? It would take a major reshuffle to accommodate Carroll and it may even mean Ben Arfa could also be on his way out with Wenger already stating an interest. All I can say on this matter is…PLEASE PLEASE DON’T BUY CARROLL EVEN IF HE COSTS AS LITTLE AS 10 MILLION, he’s simply not worth it! Let’s hope this is more misdirection from Pardew and he’s simply trying to put Carroll off before the game on Sunday, fingers crossed! What do you think about Pardew allegedly wanting Carroll back?